Delegates to the BC Nurses' Union Provincial Bargaining Strategy Conference, held January 15-16, 2018, elected the bargaining team and job action committee that will represent nurses in negotiations for a new Nurses' Bargaining Association (NBA) provincial collective agreement. These members join BCNU CEO, Executive Director and chief negotiator Umar Sheikh and BCNU President Christine Sorensen at the bargaining table in meetings with health employers and the provincial government anticipated to begin later this year. Find out more information about the bargaining committee, including the committee election process, what it takes to be a committee member, and review the full list of their responsibilities. Conference delegates also elected the representatives who will serve on the union's provincial job action committee (PJAC). This group is responsible for developing, implementing and coordinating local and province-wide job action strategies that will support negotiations and help achieve the union's bargaining goals, provides up-to-date job action information to the regional job action committees, and helps manage problems when they arise from job action. Find out more information about the PJAC committee, including the committee election process, what they do in the event of job action, how they support the bargaining process. Curious about the results? 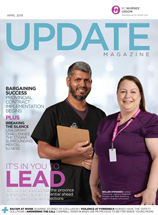 Check out the March 2018 issue of Update Magazine to review the results of the 2018 Member Bargaining Survey, conducted by Mustel Group.